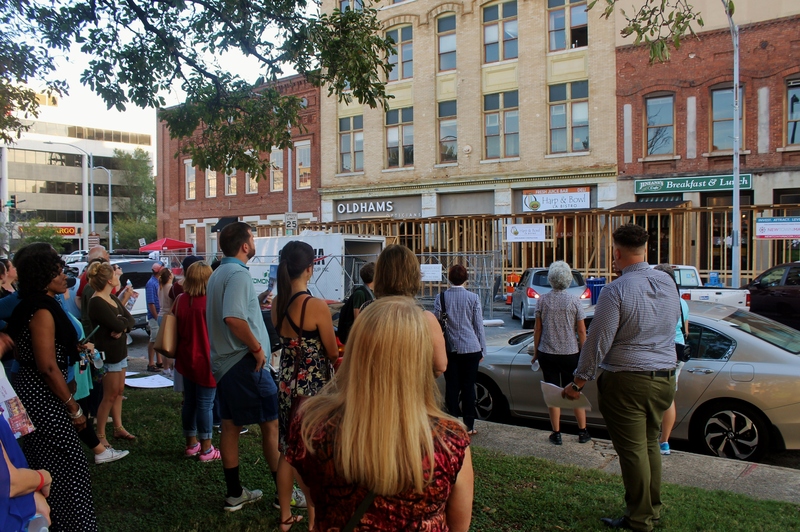 Experience the progress downtown Macon has seen over the last year by taking a self-guided tour. Visit 11 stops to see the amazing progress in downtown Macon. Due to inclement weather, NewTown Macon was unable to host our annual Tour of Progress this year. Interested persons can take a self-guided tour of 11 sites that show the progress made in downtown Macon. NewTown Macon’s annual Report of Progress is available at our offices located at 555 Poplar Street. 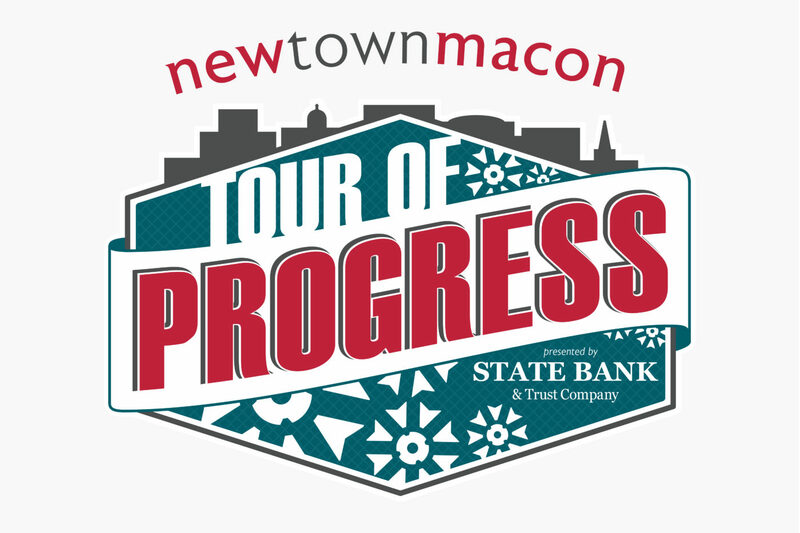 NewTown Macon’s 2018 Tour of Progress is generously sponsored by State Bank & Trust. NewTown Macon was founded in 1996 by the Peyton Anderson Foundation and local leaders to revitalize downtown Macon. At that time, downtown’s upper floors were abandoned, few storefronts had any occupants, there were only a handful of lofts and a couple restaurants. Today, the best way to understand how far we have come and how important NewTown has been in this process is to look around and take a walk. The scale and pace of revitalization is way too large for one quick walking tour to cover, so make sure you come back and explore on your own. This historic building was constructed in 1929, and originally built for the department store giant, Montgomery Ward. In 1938, it was converted in to a 450 seat theatre and many locals remember going to see the latest films at this downtown movie house. The Bibb Theater closed around 40 years ago and the building has not been in use since. The structure has suffered serious damage and approximately ¼ of the flooring system has collapsed. Last month, in partnership with Peyton Anderson Foundation, NewTown purchased this property and we are pleased to announce that the Bibb Theatre will be restored! Peyton Anderson Foundation has chosen to diversify their assets by investing in the purchase and rehabilitation of this iconic downtown structure with a forward-thinking strategy known in the foundation world as a program-related investment or PRI. This strategy and partnership will begin the process of rehabbing downtown’s last abandoned and derelict theatre. Preliminary floor plans and structural engineering specifications have already been drawn. The plans include the restoration of the interior and exterior of the building to its 1963 condition, which will include the iconic marquee. As far as a future use for this building, NewTown Macon will issue an Request For Proposals or RFP from local developers and entrepreneurs who are interested in leasing and operating the restored theater, including the actual business use, which could include a bar, brewery, distillery, restaurant, movie theater, or other type of entertainment venue. The Willingham Building will be redeveloped in tandem with the Bibb Theatre rehabilitation project under the ownership and management of NewTown Macon and the Peyton Anderson Foundation. This adjacent structure was built around 1896 for Willingham Sash and Door Company, a company which is still in operation in the downtown industrial district on Seventh Street. The building has great bones, but decades of neglect have led to the collapse of all the interior floors into the basement, leaving only the shell of exterior brick walls. Once fully rehabilitated, this historic gem will be home to nine loft apartments and one 1,700 square foot retail storefront. The owner of Felicia’s Cake Factory, Felicia Howard, is a former respiratory therapist whose entrepreneurial life began as a licensed home baker/decorator. Her at-home business was growing and she needed more space, so that led her to open this Third Street storefront. Felicia is very proactive when it comes to utilizing all the different support services available to downtown business owners, including NewTown’s own business support services, such as one-on-one business coaching, a marketing training series, and our recently launched Entrepreneur’s Academy. Felicia has had a successful first-year of business and the Cake Factory recently celebrated its one-year anniversary. The shop specializes in custom cakes and they also offer logo designed treats for personal and corporate events such as sugar cookies, cupcakes, cake pops, and cake push-pops. Their best sellers are vanilla, strawberry, and Hennessy cupcakes, as well as their red velvet strawberry shortcake slices. If you participated in the Tour of Progress last year, you may remember that construction on the Spearman Lofts project had just begun. This historic building was built as the Plaza Hotel in 1904. The building was last renovated in 1959, when the ground floor was redeveloped to incorporate two storefronts and the second and third floors were renovated for office space. The fourth floor, however, had never been updated or reused since serving as a hotel. NewTown’s rehabilitation of the property includes 12 loft apartments on the upper three floors, including studios, one and two bedroom units, all with amazing views of downtown. The fourth floor rooms are the most unique with a historic skylight in the lobby, original molding, and unique unit layouts. Rents for the units will range from $1000-$1600. Rent prices are based on square footage and recently renovated apartments in downtown Macon are currently leasing from $1.75 to $2.00/square foot on average. NewTown plans to start leasing units at the beginning of 2019. Mercer University is currently in the process of rehabbing this property. This location is nearly 10,000 square feet and it will soon be home to the University’s Fine Arts Department, housing a university gallery and studio spaces for undergraduate art students. The upstairs will be home to studios for students working towards the newly launched BFA degree. As students develop their own body of work, the close proximity to other students and the energy of an urban core will provide an exciting context for their efforts. The building will also serve as a community space, featuring musical performances, lectures, readings and other collaborative programming with the community to further cultivate the arts scene in Macon. In keeping with our new strategic plan, NewTown has officially entered into an agreement with Moonhanger Group to develop the property located at 350 Second St. NewTown Macon will work with the Moonhanger group to develop this property into a keyless-entry, nine-room boutique hotel with a speakeasy style bar located at the rear of the building. The aim of this joint venture is to accommodate the growing number of tourists who want are coming to downtown Macon to explore the restaurant, bar, and music scene. This is the site of the Macon Exchange Retail Incubator. Made possible by a Downtown Challenge grant from the Community Foundation of Central Georgia, the Macon Exchange is home to nineteen emerging brands from Middle Georgia selling items such as original art, handmade jewelry, candles, bath and body products, apparel, and more. Retail incubators have become increasingly popular across the country and provide entrepreneurs a low-cost and low-risk opportunity to test their products and the retail market. NewTown is committed to investing in these start-up entrepreneurs in hopes they will open a storefront in the future and contribute to our growing downtown. The store is open for the holiday season and hours of operation are the following: Thursday – Saturday 2pm – 8pm and Sundays 12-4. Back in May of this year, this entire block of Second Street was turned into a movie set for the filming of HBO’s DC Comics ‘Watchmen’ series. Crews were hired by the filming company to paint the facades and replace logos on windows. As you may be aware, “film” is one of the leading industries in Georgia and it speaks volumes to see companies coming to Macon to film here — definitely a testament to our city’s architecture and charm! In partnership with a private local developer, NewTown will rehabilitate and operate four lofts and three storefronts at this historic building. A major incentive with undertaking this project is that it will result in additional commercial and residential units in one of our target block, as well as rehabilitate a blighted building on a high traffic corner in downtown. This historic property was purchased by a first-time local developer. The developer is completing a complete rehabilitation of the building, including a luxury loft on the upper floor and a new commercial storefront that is currently available to lease on the busiest block of Second Street. Local contracting company Kunj Construction recently bought these two historic commercial storefronts. Although we have all gotten used to the 1970s brick façade that covered up both storefronts, you can see that the demolition crews have been uncovering these beautiful historic facades, including the historic tiles advertising the former home of ‘Independent Laundry. Kunj Construction plans to completely rehabilitate these historic buildings with lofts on the upper floors and Macon Beer Company is going to open a taproom on the first floor. This past summer the 567 Center for Renewal installed this graffiti wall thanks to a generous donation by Mark Thompson. The installation of the graffiti wall is part of The 567 Center’s mission to use art as a way for the community to breathe new life into downtown Macon. The Graffiti Wall is a place for graffiti artists, mural artists, or any aspiring artist to practice their craft and express themselves. Each year, NewTown recognizes businesses, organizations, and individuals who have demonstrated exceptional passion and commitment to the revitalization of Downtown Macon. The awards are given in one of eleven categories: The R. Kirby Godsey Leadership, Juanita T. Jordan Community Service, Growing Jobs, Increasing Residents, Creating a Sense of Place, 360 Degrees, Special Recognition, Emerging Partner, Emerging Leader, Downtown Ambassador, and Spirit of Cooperation. Awards may or may not be given in every category. The R. Kirby Godsey Leadership Award is presented to an individual whose accomplishments and professional contributions to downtown’s revitalization have been outstanding and innovative. This award, along with the Juanita Jordan Award, are the highest awards that our Board of Directors can bestow, and are not given every year. These awards are only given to recognize exceptional contributions to downtown over many years if not decades. The Juanita Jordan Community Service award is given to an individual or organization who has gone above and beyond in the field of community service within our community. Again, one of our highest regarded awards. The Partners in Progress Award for Growing Jobs Award goes to individuals, businesses, or organizations strengthening the quantity and quality of jobs in the downtown area. The Emerging Leader award goes to an organization or individual that has made significant contributions to Downtown Macon and has demonstrated the potential for leadership and continuing service. The recipient of the Partners in Progress Award for Increasing Residents may directly increase residents by renovating or create buildings that house lofts, apartments or condominiums or by financing residential development or promoting downtown living. The Partners in Progress Award for Creating a Sense of Place winner may establish a popular event; improve the aesthetics of downtown; create a business, which attracts people to downtown; protect or preserve an endangered building or property; strengthen the community; or enhance public space. The 360-Degree Award honors individuals, businesses, or organizations, which are improving all aspects of downtown. The 360-degree award winner exhibits a commitment to all three of NewTown’s focuses: increasing residents, growing jobs and creating a sense of place. The Special Recognition Award is presented to an individual or organization for outstanding efforts in a specific area of revitalization of downtown or community improvement. The Emerging Partner Award showcases new individuals or organizations becoming involved in the downtown movement. The Downtown Ambassador Award goes to an individual or organization acting as a representative or promoter of downtown. The nominee may encourage the community to visit, live, shop or recreate downtown. The nominee would be characterized as a positive force for downtown.